Seven years after the death of Arthur Pendragon, Sir Percival, the last surviving knight of the Round Table, returns to Albion after a long and futile quest for the Holy Grail. The peaceful and prosperous home that he left a decade earlier is no more. Camelot has fallen, and much of the Pendragon’s kingdom has been subjugated by the evil Morgana and the Norse invaders who once served under her banner. Although the knight desires only to return to his ancestral lands and to live in peace, he vows to pursue one last quest before he rests–to find Guinevere, the Queen of the Britons. This journey will force the knight to travel the length and breadth of Albion, to overcome the most fearsome and cunning of enemies, and to embrace a past that is both painful and magnificent. The Return of Sir Percival is the tale of a knight who seeks peace, but finds only war, of a Queen who has borne sorrow and defeat, but who will not yield, and of a valiant people determined to cast of the yoke of their oppressors. It is also a tale of tragedy and triumph, and of romance lost and then found. 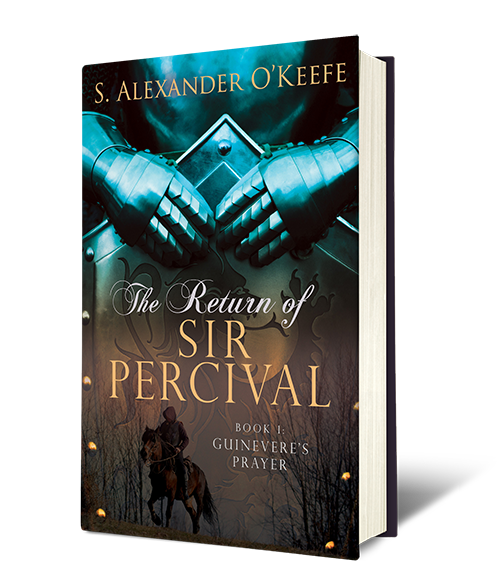 The unique vision of the Arthurian world brought to life in S. Alexander O’Keefe’s The Return of Sir Percival takes readers on a journey that is as enthralling as it is memorable. If you are reading The Return of Sir Percival as part of a book group, you can download this Reader’s Guide for some questions to get the conversation started. If you have already read The Return of Sir Percival, you can learn more about the author’s intent by downloading the Author Q&A PDF. Sign up for the newsletter to follow the latest from O’Keefe.